Guildenstern: A man talking sense to himself is no madder than a man talking nonsense not to himself. Rosencrantz: Or just as mad. Guildenstern: Or just as mad. Rosencrantz: And he does both. Guildenstern: So there you are. Guildenstern: A man, breaking his journey between one place and another, at a third place of no name, character, population, or significance sees a unicorn cross his path and disappear. That in itself is startling, but there are precedents for this sort of mystical encounter, or rather, a choice of persuasions to put it down to fancy, until – "My god!" shouts a second man, "I must be dreaming! I thought I just saw a unicorn!" At which point a dimension is added which makes the experience as alarming as it will ever be. A third witness, you understand, adds no new dimension, only spreads it thinner, and a fourth thinner still, and the more witnesses there are, the thinner it spreads and the more reasonable it becomes until it is as thin as reality – the name we give to the common experience. "Look! Look!" recites the crowd. "A horse, with an arrow in its forehead! It must have been mistaken for a deer!" Rosencrantz: I knew all along it was a band. Guildenstern: He knew all along it was a band. Rosencrantz: And here they come! Guildenstern: I'm sorry it wasn't a unicorn. It would have been nice to have unicorns. Guildenstern: Don't you discriminate at all?! Guildenstern: Which even at first glance doesn't strike one as a particularly rewarding speculation in either sense … even without the monkeys. I mean, you wouldn't bet on it. I mean, I would, but you wouldn't. Guildenstern: What a shambles! We're just not getting anywhere. Rosencrantz: Not even England. I don't believe in it anyway. Guildenstern: Just a conspiracy of cartographers, you mean? Guildenstern: What's the first thing you remember? Rosencrantz: Oh, let's see. … The first thing that comes into my head, you mean? Guildenstern: No – the first thing you remember. Rosencrantz: Ah. … No, it's no good. It's gone. It was a long time ago. Guildenstern: No, you don't take my meaning. What's the first thing you remember after all the things you've forgotten? Rosencrantz: Oh, I see … I've forgotten the question. Guildenstern: Who are we that so much should converge on our little deaths? The Player: You are Rosencrantz and Guildenstern. That's enough. Player: It never varies – we aim at the point where everyone who is marked for death dies. Guildenstern: I think I'm going to kill you. 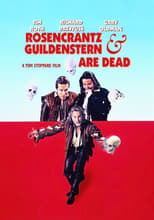 Guildenstern: No, no, no … death is not. Death isn't. Take my meaning? Death is the ultimate negative. Not-being. You can't not be on a boat. Guildenstern: No, no … what you've been is not on boats. Rosencrantz: Shouldn't we be doing something – constructive? Guildenstern: What did you have in mind? … A short, blunt human pyramid …? The Player: Hamlet … in love … with the old man's daughter … the old man … thinks. The sight is dismal; and our affairs from England come too late: the ears are senseless that should give us hearing, to tell him his commandment is fulfill'd – that Rosencrantz and Guildenstern are dead. Lines of Hamlet, from which the title of the play and movie are derived.